Lord have mercy I just witnessed some serious greatness! 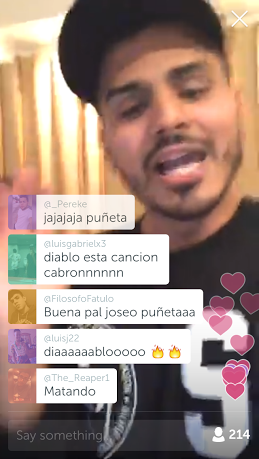 Álvaro Díaz just had a live listening party on #Periscope for his new EP, iLUMILATIN Vol.1, and to say that it was hype does not even begin to do it justice! Over the last few weeks, Díaz and his crew have been working on this 5 track project and it’s like nothing he’s put out before. These Young Martino produced beats are next level and you can definitely tell that Travi$ Scott was a huge influence on them. La Flame vibes are all over this! La Champaña, Donde Estan Mis Chavos, Elvira Hancock, and Monstar make up iLUMILATIN Vol.1 and with these song titles alone you already know this EP is FILTHY! As I was reading Álvaro’s fan comments during the stream I kept seeing “Alvaro Scott”,”Alvaro West”…I could be cliché and nickname him Alvaro Scott West but nah this kid is in a league of his own…ÁLVARO FOKIN DÍAZ! You’re definitely going to want to stay tuned next week for the release of iLUMILATIN Vol. 1 but if you can’t wait that long (which I don’t blame you) you can download PERISCOPE now and you have 24 hours to view the listening party! Álvaro Díaz and LV CIUDVD deserve to toast tonight for being absolute visionary MONSTARS.